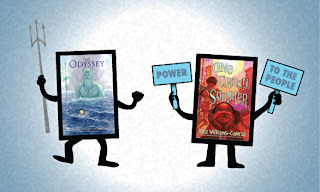 I have fallen so far behind in my internet reading that I completely missed Round 1 of the School Library Journal's 2011 Battle of the Kids' Books! What travesty! Deep into round two, there has of course been much excitement and upset. Two of my favorite books of the year were mercilessly booted after only *one* match! Seriously, people? The Dreamer lost to The Good, the Bad, and the Barbie, a non-fiction book about the history of Barbie. One Crazy Summer lost to a graphic novel version of The Odyssey. I haven't read the Barbie history or the graphic novel, so I can't cry foul. Both are acclaimed to be excellent works in their own right. But what about the beautiful, poetic portrayal of young Pablo in The Dreamer? And the fascinating subject matter and honest characterization in One Crazy Summer? Argh! See what this silly game does to me? I'm all kerfluffled. The Cardturner by Louis Sachar. I love Louis Sachar, but was a little reluctant to pick up a book revolving around the game of bridge. However, the book has made it through two rounds with ease. I've been swayed. Hereville: How Mirka Got Her Sword by Barry Deutsch. Hereville lost the book battle in the first round, but a book with "Yet Another Troll-Fighting 11-Year-Old Orthodox Jewish Girl" on the front cover? I must read. Okay, quit reading this and head over to The Battle of the Kids' Books before Round 2 is over already!